We’d been working with Moomin Characters for about a year when Marika Makaroff, CEO of Gutsy Animations, got in touch in spring 2017 to ask for our support with a crowdfunding campaign for a new television adaptation of the Moomin stories. We immediately fell in love with Marika’s vision for a new adaption that was totally loyal to the spirit and values of Tove Jansson’s creation and portrayed the full range of emotions – good and bad – explored within her Moomin stories. We worked with Gutsy and their crowdfunding consultant to secure widespread media coverage and mobilise the Moomin fanbase worldwide, resulting in the campaign securing 127% funding and reaching a total of US$253,230. On the back of that success, we were thrilled to be appointed by Gutsy to handle consumer and B2B PR throughout the development and production process, helping to attract the attention and interest of buyers around the world. Our remit included making all major announcements about the production, including our UK voice cast announcement which saw Moominvalley being discussed by presenters on the BBC Breakfast sofa and by Nick Grimshaw on the BBC Radio 1 Breakfast Show as well as news stories on Variety, Entertainment Weekly, Stylist, NME and many more. 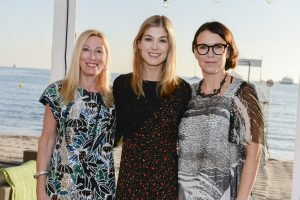 At MIPCOM 2017 we organised a beach party with Rosamund Pike, who voices Moominmamma, to guarantee that buyers would take time out of their hectic schedules to come to our event. We also took the opportunity to arrange a full-page interview with Rosamund for the MIPCOM Daily Paper, ensuring that Gutsy and Moominvalley had high visibility during the market. We announced various acquisitions, working with broadcast partners worldwide including Yle in Finland, Sky in the UK and NHK in Japan. Further collaborators came on board in the form of Columbia Records, part of Sony Music, who we announced would be partnering with Moominvalley on the soundtrack with Columbia artists including Tom Odell and First Aid Kit writing brand-new feature songs for each episode of the first series. In the run-up to the animation airing, we identified what needed to be done to supplement the work of Sky’s consumer PR agency in the UK and placed a couple of major features looking at the new animation from a literary point of view. Tove’s original Moomin stories are at the heart of everything that the Moomin brand does so it was important to make sure they featured alongside interviews with the starry cast and team. We invited journalists out to the worldwide premiere in Helsinki, where they were able interview Tove’s niece Sophia plus Mark Huckerby and Nick Ostler, the lead writers on the series, for spreads on the source material in the Guardian and The i Paper. We also collaborated on some trade media opportunities, telling the story of the production from Gutsy’s perspective with written pieces from Marika and Academy Award-winning director Steve Box. 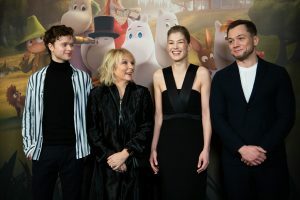 At the Helsinki premiere, we hosted four members of the UK cast: Rosamund Pike (Moominmamma), Taron Egerton (Moomintroll), Jennifer Saunders (Mymble) and Edvin Endre (Snufkin). Together with Gutsy and Sky’s team we organised an afternoon of international media interviews for the voice talent plus key members from the production team. Later that day we hosted the UK talent at the premiere itself, which included a red carpet moment with photo opps and further interviews, and were the first port of call for talent during their visit to Finland. Seeing something turn from creative vision into reality is always a magical experience, but it’s even more wonderful when the timing is so right. The world needs the Moomins – and the lessons they can teach us about tolerance, respect and welcoming difference – more than ever right now. It’s been a joy to have played a role in this project right from the beginning. Marika, Steve and the incredibly talented team at Gutsy have done a wonderful job of honouring Tove’s work, presenting it for a contemporary audience in a fresh and cutting-edge way. We’re so excited for the rest of the world to see it. Several of the longlisted authors looked to their own family histories for inspiration. In A Perfect Explanation, Eleanor Anstruther tells the shocking story behind her aristocratic grandmother’s selling of her son (the author’s father) for £500, while Testament was inspired by Kim Sherwood’s grandmother’s experiences as a Holocaust survivor. Anna Mackmin’s Devoured is influenced by the award-winning theatre director’s own childhood spent in a hippy commune in Norfolk. Stubborn Archivist by Yara Rodrigues Fowler, who co-created the GE2017 Tinder chat bot to campaign for Labour in the 2017 General Election, examines cultural duality as experienced by the author in her own Brazilian-English household. Magical realism and the fantastical loom large this year, with The Chameleon by Samuel Fisher, Follow Me to Ground by Sue Rainsford and Everything Under by Daisy Johnson – the youngest ever Man Booker Prize shortlistee – all making the longlist. Elsewhere, Golden Child by Claire Adam, published in the US by Sarah Jessica Parker’s SJP for Hogarth imprint, Hold by Michael Donkor and Future Popes of Ireland by Darragh Martin explore the great themes of love, belief and abandonment within the frame of three uniquely troubled families. Independent publisher Salt and HarperCollins imprint 4th Estate each have two titles on the list, which sees independents take on the big publishing houses. The longlisted authors include two Observer ‘new faces of fiction’: Michael Donkor and Yara Rodrigues Fowler, who were featured in 2018 and 2019 respectively. The Desmond Elliott Prize has a track record of spotting exceptionally talented novelists at the very beginning of their careers. Last year, the Prize was awarded to Preti Taneja for her debut novel, We That Are Young. Since winning the Desmond Elliott Prize, We That Are Young has been published in the US, Canada, India, Germany and France. Other past-winners include Francis Spufford, Claire Fuller and Eimear McBride. Alan Hollinghurst is joined on the judging panel by the literary editor of The Times, Robbie Millen, and managing director of the Booksellers Association, Meryl Halls. A shortlist will be announced on 10th May and the winner will be revealed at a ceremony at Fortnum & Mason on 19th June, where they will be presented with a cheque for £10,000. Talking Politics, the political podcast hosted by David Runciman and sponsored by the London Review of Books, has passed the 5 million download milestone just ahead of its 150th instalment. The hugely popular podcast now averages 70,345 listens per episode and 492,415 listens per month. In 2018, it was listened to in 196 countries. 60% of listeners are in the UK and 10% are in the United States, where the audience is steadily growing. Recorded weekly at the University of Cambridge, where Runciman is Professor of Politics, Talking Politics combines a regular panel of experts with invited guests. It is usually co-hosted by Professor of Political Economy, Helen Thompson. The first episode, released in September 2016, featured Israeli historian and author of the bestselling book Sapiens: A Brief History of Humankind, Yuval Noah Harari. Other popular contributors have included historians Adam Tooze and Jill Lepore, philosopher Martha Nussbaum, authors Oliver Bullough and Pinkaj Mishra, and economist Thomas Piketty. Recent topics have included surveillance capitalism, Facebook as a threat to democracy, and the place of fear in contemporary politics, alongside the politics of the World Cup, food and Brexit, and whether or not six-year-olds should be able to vote. Last week, the London Review of Books launched a new podcast, ‘The State of…’, hosted by LRB editors Joanna Biggs and Tom Crewe – who are joined each month by two guests trying to understand a little better the state of our times. Within 24 hours ‘The State of…’ reached the top ten of the UK Podcasts Chart. 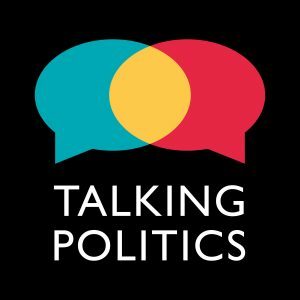 Talking Politics is the podcast that tries to make sense of the unpredictable, often alarming and always interesting political moment we’re living in. Hosted by David Runciman, with help from a panel of political experts from Cambridge and guests ranging from historians and economists to philosophers and novelists, it offers a historical long-view perspective on current events. Big ideas are explored in a non-combative way. The podcast is totally independent, balanced and offers up a wide range of political views. A large portion of its listeners are in the UK but it also has a sizeable and growing following in the US. A new episode is uploaded every Thursday morning. The LRB is Europe’s leading magazine of culture and ideas. Published twice a month, it provides a space for some of the world’s best writers to explore a wide variety of subjects in exhilarating detail – from art and politics to science and technology via history and philosophy, not to mention fiction and poetry. In the age of the long read, the LRB remains the pre-eminent exponent of the intellectual essay, admired around the world for its fearlessness, its range and its elegance. As well as book reviews and reportage, each issue also contains poems, reviews of exhibitions and movies, ‘short cuts’, letters and a diary, and is available in print, online, and offline via our app. Subscribers enjoy unlimited access to every piece we’ve ever published in our digital archive. Our website also features a regular blog, podcasts and short documentaries, plus video highlights from our events programme on both sides of the Atlantic, and at the London Review Bookshop. 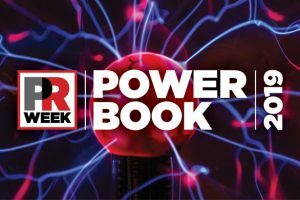 Preena Gadher, co-founder and MD of Riot Communications has been included in PR Week’s 2019 Power Book, which recognises the top 100 most influential and respected communications professionals in the UK today. Entering the list for the first time, Gadher is among the 9%* of the entire PR workforce who is from a BME background. Gadher said: “It’s a huge honour to make PR Week’s Power Book, not least as one of the few BME agency heads. Having taken a slightly unusual path – co-founding an agency without having ever worked in one! – I hope this can, in a small way, help show people who are currently underrepresented in our industry, that PR is a profession for all, no matter what your background or who your connections. All you need is determination and a healthy dose of resilience! We still have a long way to go, but change will come. Lyra Silvertongue, one of the world’s favourite heroines, is to return this autumn in The Secret Commonwealth, the second instalment in Philip Pullman’s bestselling The Book of Dust. The book will be published on 3rd October 2019 by David Fickling Books in association with Penguin Random House UK. Lyra is no longer a child. The Secret Commonwealth is set 20 years after the events of La Belle Sauvage: The Book of Dust Volume One unfolded, and seven years after readers left Lyra and Will Parry on a park bench in Oxford’s Botanic Gardens in The Amber Spyglass, the final book in the His Dark Materials series. Global in scale, The Secret Commonwealth: The Book of Dust Volume Two sees Lyra, now an independent young woman, forced to navigate a complex and dangerous new world as she ventures far beyond the edges of Oxford, across Europe and into Asia, in search of an elusive town said to be haunted by dæmons. As well as taking readers on an exhilarating journey into places that are at once familiar and extraordinary, the book is a timely exploration of what it is to be human, to grow up and make sense of the world around us, from one of the UK’s greatest writers. Details of the book, released today by Pullman’s publishers, are accompanied by a first look at the beginning of The Secret Commonwealth, showing Lyra at odds with her dæmon, Pantalaimon, after they unwittingly witness a murder. “Things have been biding their time, waiting for the right moment to reveal their consequences for Lyra Silvertongue. The Secret Commonwealth tells the continuing story of the impact on Lyra’s life of the search for, and the fear of, Dust. I found it intriguing and deeply exciting to discover how great events can turn on a little moment, and how revenge can be nurtured and fed and watered till it grows beyond control. “Like the original readers of His Dark Materials, Lyra has grown up. Her concerns are adult ones, and this new perspective – coupled with Philip’s unflinching look at the human condition and his extraordinary storytelling – makes for a breath-taking read. “I feel as if I know Lyra Silvertongue (and Pantalaimon) so well. The most natural, mischievous and spirited girl you could ever wish to meet, and more than that, a friend. To me, she outstrips all the coming-of-age protagonists of the past 100 years: Harry Potter, The Hunger Games’ Katniss Everdeen, The Magic Toyshop’s Melanie, On the Road’s Sal Paradise and To Kill a Mockingbird’s ‘Scout’ Finch. Lyra is the one-off original, simply the best. The Secret Commonwealth publication follows the chart-topping success of the first volume of The Book of Dust – La Belle Sauvage – in October 2017. It can be read as a standalone, paired with La Belle Sauvage: The Book of Dust Volume One, or set alongside Lyra’s adventures in the internationally bestselling His Dark Materials series (Northern Lights, The Subtle Knife and The Amber Spyglass). Chris Wormell will also return to illustrate the cover and the chapter headings. Filming of the highly anticipated TV adaptation of His Dark Materials, produced in Wales by Bad Wolf, has now wrapped and a teaser trailer released. Written by playwright Jack Thorne (Harry Potter and the Cursed Child, This is England ’88) and directed by Tom Hooper (The King’s Speech, Les Misérables) and Otto Bathurst (Robin Hood , Peaky Blinders), the series will be broadcast by HBO and BBC One in the near future. The stellar cast includes Dafne Keen (Lyra), James McAvoy (Lord Asriel), Ruth Wilson (Mrs Coulter), Anne-Marie Duff (Ma Costa), James Cosmo (Farder Coram), Clarke Peters (Master of Jordan College), Lucian Msamati (John Faa) and Lin-Manuel Miranda (Lee Scoresby). The Secret Commonwealth: The Book of Dust Volume Two will be published in hardback, ebook and audiobook on Thursday 3rd October 2019 by David Fickling Books in association with Penguin Random House in the UK, featuring original new illustrations from Chris Wormell. ‘That’s another thing,’ he said. She knew he was right, but it wasn’t right that he should speak to her accusingly, as if it was something to blame her for. ‘I used to be young,’ was all she could find to say. The Secret Commonwealth: The Book of Dust Volume Two will be published by David Fickling Books in association with Penguin Random House in the UK, priced £20 (hardback, ebook, CD), £14.99 (trade paperback) and £12 (audiobook) on 3 October 2019. La Belle Sauvage: The Book of Dust Volume One is available in hardback and ebook editions (£20), paperback edition (£7.99) and audiobook, narrated by Michael Sheen (£13). His Dark Materials: Northern Lights, The Subtle Knife andThe Amber Spyglass are published in hardback and paperback by Scholastic, priced £12.99 and £7.99 respectively, with covers by Chris Wormell, and in ebook by Penguin Random House, priced £4.99. Sir Philip Pullman was born in Norwich, UK, in 1946 and educated in England, Zimbabwe, Australia and Wales. He read English at Exeter College, Oxford. His first children’s book, Count Karlstein, was published in 1982 (later republished in 2002). It was followed by The Ruby in the Smoke (1986), the first in a quartet of books featuring the young Victorian adventurer, Sally Lockhart. He also published a number of shorter stories, which he calls fairy tales, including The Firework-Maker’s Daughter, Clockwork, I Was a Rat! and The Scarecrow and His Servant. To date, he has published 33 books, read by children and adults alike. His most famous work is the His Dark Materials trilogy: Northern Lights (1995, published as The Golden Compass in the USA); The Subtle Knife (1997) and The Amber Spyglass (2000). These books have been honoured by several prizes, including the Carnegie Medal, the Guardian Children’s Book Award, and (for The Amber Spyglass) the Whitbread Book of the Year Award – the first time in the history of that prize that it was given to a children’s book. Pullman has received numerous other awards, including: the 2002 Eleanor Farjeon Award for children’s literature, and the 2005 Astrid Lindgren Award, jointly with the Japanese illustrator Ryoji Arai. The first volume of The Book of Dust – La Belle Sauvage – was published in October 2017 to great acclaim, winning the Waterstones Book of the Year in December 2017, securing Pullman ‘Author of the Year’ at both the British Book Awards 2018 and the Specsavers National Book Awards 2018, and the audiobook – narrated by Michael Sheen – ‘Audiobook of the Year’ at the British Book Awards 2018. Pullman was knighted for services to literature in the New Year’s Honours 2019. 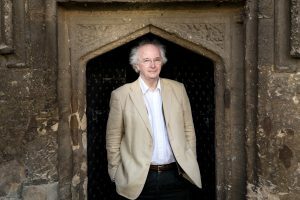 Sir Philip Pullman lives in Oxford. Further information can be found at www.philip-pullman.com. David Fickling set up David Fickling Books in 1999 as an imprint of Scholastic and then developed the same brand as an imprint of Random House from 2001 until 2013. During this time, he published Mark Haddon’s The Curious Incident of the Dog in the Night-time (bestseller and award-winning play), as well as John Boyne’s The Boy in the Striped Pyjamas, Jenny Downham’s Before I Die and Andy Mulligan’s Trash – all international bestsellers and, later, hit Hollywood movies. In 2012, he launched a weekly story comic for children called The Phoenix, which has been rated the second-best comic in the world by TIME magazine. Recent notable publishing successes from DFB include La Belle Sauvage by Philip Pullman (co-published with Penguin Random House UK) and The Art of Being Normal by Lisa Williamson, which won the Waterstones Children’s Book Prize for Older Fiction in 2016.